Shop our unique selection of Bull Terrier Gifts. We have an expanding collection of handmade pottery, decorated with your favorite version of Bull Terrier. Our standard Bull Terrier is white with a dark eye patch but you can have your Bull Terrier gifts customized with any version of coat color or markings, such as brindle and white Bull Terrier, red and white Bull Terrier, fawn Bull Terrier...the options are endless because we do all of the artwork in-house. Just select the "custom" option on the item page (a small art fee will be applied for custom work) and submit a picture of your dog so we can see its markings, and we will made a very personalized gift for you. 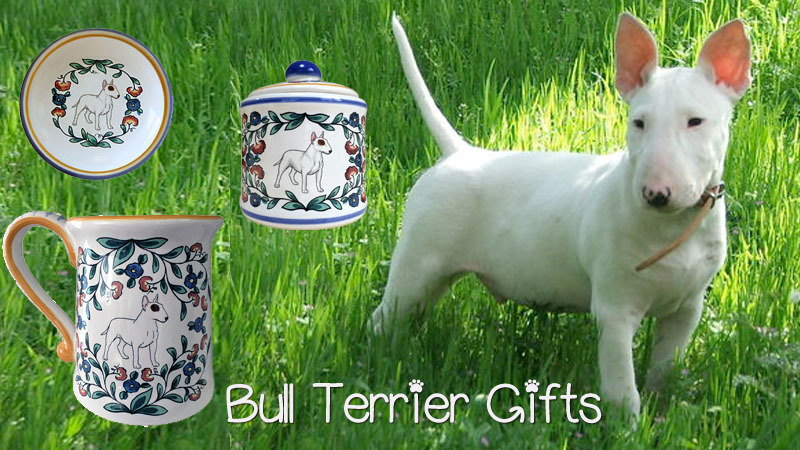 Choose from a unique selection of Bull Terrier items, such as Bull terrier mugs, wine stoppers, sugar bowls, creamers, dipping dishes, and treat jars. All of our stoneware is made here, in our Eureka, CA, studio in small batches. What this means for you is that your Bull Terrier gifts are made with integrity, made in America, and imbued with the joy of the creative process. And let's not forget that stoneware is also very durable. So you will smile at having your Bull Terrier's likeness on a beautiful piece of pottery, and because you can microwave and dish-wash it to your heart's content. How about that? Who can forget Spud's McKenzie, the spokes-dog for Coor's Light? Well, people of a certain age will remember Spuds. What a character, as is Bullseye, the mascot for Target Store's. I guess that's what comes to mind when you think of this breed – personality. Plus, they are endowed with a very cute look that screams "throw me a ball", "let me help you eat that", "love me". We are very glad to celebrate this breed with our hand decorated pottery and are sure you will find the perfect Bull Terrier gift here.